Here at Philadelphia Wildlife Experts, Inc. we specialize in the removal of unwanted nuisance wildlife from residential homes and commercial buildings. We most commonly deal with the removal of critters from attics, but we deal with all facets of wildlife removal and control. Common scenarios that we deal with include - the removal of squirrels from the attic or soffit of a house - the removal of raccoons from attics or chimneys - the removal of a colony of bats from inside a building - bird and pigeon control at commercial properties - total rat and mouse control - general wildlife trapping (groundhogs, skunks etc). We not only remove all nuisance wildlife species, but we perform preventative repairs to houses and buildings, to make sure that wild animals do not get back in. 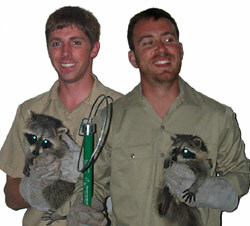 We also provide wildlife cleanup services. Give us a call any time at 610.927.7792, and we can schedule an appointment.